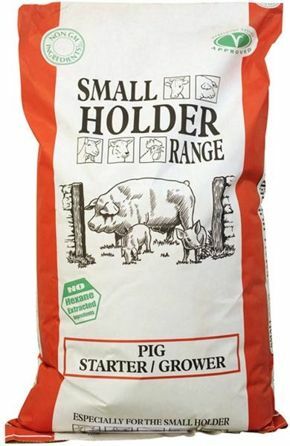 Pig Starter/Grower Pellets are a starting feed from 2 weeks. Introduce feed from about two weeks old. You may need to mix it with water to form a mash initially. Start with just a handful of feed, and gradually increase in line with their appetite. Free range, rare or traditional breeds may only need 1kg at 9 weeks, gradually increasing to 2.5kg at 22 weeks and 2.7kg at 32 weeks plus. If no other feed sources are available, feed to appetite until 15 weeks old, after which they will normally need about 4kg a day, split into two feeds. This feed should be fed with ad lib fresh water. Do not feed to sheep.